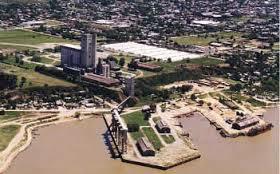 San Pedro is a city in the northern part of the province of Buenos Aires of 46.000 inhabitants located approximately 100 km from Rosario and 250 km from Buenos Aires. It is in the midst of an important farming and fruit producing area (specially peaches and citrus). There is little industrial activity, except for some fruit processing and packing plants. The Nuevo Central Argentino railway line passes some 4 km from the port and the Santa Fe – Buenos Aires highway is some 12 km away. Other provincial highways connect San Pedro with the farming area in the province of Buenos Aires. The principal port activity is related to grain, fruit and agricultural by-products. 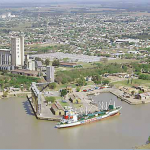 Occasionally, due to low river condition, vessels bound for Villa Constitución or San Nicolas with imports of iron ore or other bulk cargoes lighten at San Pedro. The port consists of piers Nº 1 and Nº 2, with a river craft basin between them. Pier Nº 1 is 220 m long with the elevator loading gallery on its southern side, for ocean going vessels, and the pierhead 85 m long, where vessels load fruit or other bulk agricultural by-products via portable conveyor belts. Loading at the elevator berth is by means of an overhead loading gallery fitted with 7 telescopic chutes; air draft is about 23 m at datum. The loading rate is about 1200 TPH. Total storage capacity at the elevator and adjacent sites is presently 121.000 ton. Pier Nº 2 is for small craft/home trade vessels. The grain elevator, is owned by Terminal Puerto San Pedro. Installations are capable of receiving from trucks up to 4.500 TPD. Nearby is a 50.000 sqm truck parking area.Grain exports 2011 amounted to 369.000 tons and citrus in pallets 187.000 tons. Entrance is via a short access channel 60 m wide, vessels dropping starboard anchor off the pierhead and coming astern, maneuvering into the berth stern first, with head and stern ropes out onto the Nº 1 pier to berth port side to quay. The starboard anchor is recovered once alongside. No tugs at San Pedro and vessels berth bow out without the aid of tugs. In case of adverse weather conditions vessels customarily await improvement of conditions before proceeding rather than requesting tugs from elsewhere. Anchorage for 3 vessels. Auxiliary roads used mainly for topping off or lighterage operations and can accept 2 vessels. Access channel, turning basin and basin for ocean going vessels (Elevator berth at Pier Nº 1 and Pierhead), dredged to 9,15 m (30 ft) at datum. Affected by seasonal fluctuations of Paraná and Paraguay rivers. The river is usually highest from February-May and lowest around Sept-Oct. Mean average level at San Pedro is 5 ft above datum. Tidal influence can be felt at San Pedro, particularly when SE´ly gales blow off River Plate causing rise of river level, but its influence is not important. Provided river levels permit, vessels may load to the limiting depth in the Mitre channel plus an allowance for the tide, always maintaining an UKC of two feet as required by Coastguard regulations. Thus, if the river level at San Pedro at any given time is, say, 11m (36 ft) or more and the governing depth in the Mitre channel is 9,70 m (32 ft) then, taking advantage of the usual 1 or 1,3 m (3 or 4 ft) of tide in the River Plate, a sailing draft of 10/10,30 m (33/34 ft) is possible. Daylight arrivals/sailings only. No length/beam restrictions but recommended not exceed max LOA 225 m and maximum beam 33 m. Reefers and other coastal vessels: no berthing / unberthing restrictions. VHF via San Pedro Radio call/safety on ch 16. Operations on ch 25, 27, 28. San Pedro Prefectura Naval Radio (Coastguard) call sign L6E. VHF on ch 12. Agents VHF ch 10. 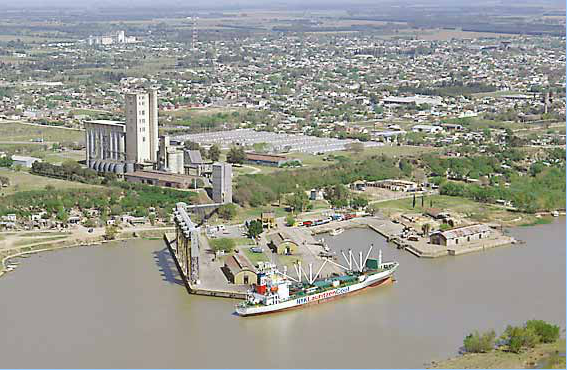 Port pilot station is at Rosario (private companies). 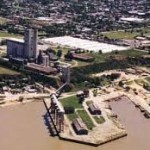 Paraná river pilots may be requested from Rosario or Buenos Aires, according to the company appointed. Minimum advance notice of 3 hours required. Available at the municipal hospital and 2 private clinics. 3 hotels, generally with room available. From Buenos Aires or Campana, by truck or barge. Berths have fixed rubber fenders. Available by pipeline at berth (8ton/hour). Compulsory, for all foreign flag vessels over 2000 GRT. Discharge by crane from Vessel to truck. There are no local workshops. Repairs may be requested at Buenos Aires, San Nicolas or Rosario workshops which must be registered with coastguard authority. Supplies in small accounts can be provided by local suppliers, otherwise are provided through Buenos Aires/Rosario. There are 4 open storage spaces within the port area. There are warehouses for fruit pallets, totalizing 18000 sqm.